Exiled for the sake of the word of God to the island of Patmos, St. John, under the influence of the Holy Spirit, had visions in symbolic scenes which indicate, interpret and clarify things which are happening, or which are going to happen in the life of the Church (Rev. 1:1-11). In familiar images from the Old Testament, and from the current life situation in the Church, St. John saw and depicted for us the struggles of the Church of Christ against the manifold evils and the battles between the kingdom of God and the kingdom of the world. Behind the images of the beast and the prostitute woman, for example, are the persecutions by political and religious opponents of the Church, particularly the Roman Empire. Always hidden behind these opponents is the ancient serpent, the dragon, the devil, Satan himself, who deceives the nations and turns them against the Church. The fundamental idea of the Book of Revelation is the belief that Christ is the Lamb, sacrificed for us. He who opens the seals of the book is the ruling king revered and worshipped by the Church in heaven and on earth (Rev. chs. 4, 5, 6, 12, 19). The Lord Christ, the sacrificed Lamb, leads the struggle with His armies, the Saints of the Church. Their weapon is their faith in the word of God to the point of self-sacrifice. The blood of the Lamb, the sacrifice of Christ on the Cross and His Resurrection strengthen them; the victory over the enemy is certain (Rev. 6:2; 12:11; 19:17-18). The Christology in the Book of Revelation, which emphasizes Christ as the sacrificial Lamb, is the most powerful witness for the power of the Cross in the salvation of the world, as the Church experienced it. The Cross, the Resurrection, the Parousia, all indicate clearly the absolute sovereignty of Christ (cf. 1 Cor. 11:26). In chapter 1, St. John speaks about the origin of his revelation. The source of the revelation is God Himself, but it is Christ who, through an angel, reveals to St. John things which must shortly take place. Christ, the second person of the Holy Trinity, is always the mediator between God and the world. The Father through the Son in the Holy Spirit creates and saves everything. In chapters 2-3, St. John has visions on the contemporary spiritual condition of the Church in Asia. Christ exhorts the leaders of the churches to be steadfast in their faith and promises rewards for the victorious ones. These promises are mentioned throughout the whole book and especially in chapters 21-22. In chapters 4-5, St. John is in heaven in spirit and sees heavenly visions. We have similar visions in the Old Testament (cf. Is. 6:1f. ; Ezek. 1:1f. ; 2 Cor. 12:2-4). He sees the throne of God in all of its glory. Around the throne are twenty-four presbyters and four living creatures who represent the Church of the Old and the New Testament and the world, and they praise God the Creator. Between them and the throne stands Christ as the Lamb sacrificed, slain, for our salvation. The picture signifies the mystery of our salvation in Christ. At the right hand of God there is a book that is sealed with seven seals. No one can open, understand, or even look upon the book. Only Christ the Victor can open it; only the mystery of Christ can shed light on the mystery of the world. The book must symbolize the eternal will of God for the destiny of the world, and what is to happen to it, as St. John sees it in the Spirit in chapters 6-20. Christ who opens the seals of the book is the center and the ruler of history and the world. He lives and continues the work of salvation to the end. The vision in chapters 4-5 is truly magnificent. God the creator and ruler of the universe is there in the brightness of the throne. Christ, through whom all things are created and through whom the plan of salvation is realized, is there as the Lamb slain for the salvation of the world. The entire Church and the whole world, in heaven and on earth, glorify God and the Lamb who was sacrificed for the sins of the world. God and Christ are inseparable and the Church glorifies them together (Rev. 4:9; 5:8-14). St. John has seen this vision on the "Lord's day" (Rev. 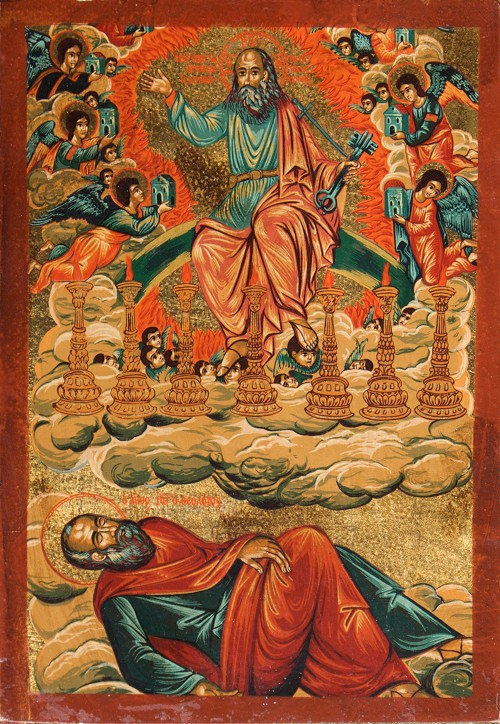 1:10), and chapters 4 and 5 have been considered as a prototype for the Divine Liturgy where the one Church of God lives the blessedness of salvation. In our worship, earth and heaven, time and eternity become one eternal present in the presence of God. The magnificent vision which St. John saw in chapters 4-5 will be the main consolation for him and for the struggling Church and an assurance for the final victory. God and Christ are in control of history, and truth and love will prevail, while evil will finally disappear from the world (Rev. 20:10), and a new life will come to the world created and saved by God in Christ (Rev. chs. 21-22). In chapter 6, Christ opens the first seal. St. John sees Christ as a magnificent victor. In the Book of Revelation, only Christ is the victor (cf. Rev. 19:11; Jn. 16:33). Here the first rider must represent Christ, the Church with the Gospel ready to face the other coming catastrophic riders, who represent worldly powers. This is the theme of the whole Book of Revelation: the struggle of the Church and its victory over evil by the power of the blood of Christ. St. John sees three other demonic powers, in opposition to Christ, that bring grief to the world and to the Church. He dramatically envisions the struggle between the Church and its enemies in the form of wars. Natural catastrophes are depicted as punishment from God for the enemies of the Church. The same theme, the persecution of the Church and the punishment of the persecutors, is repeated in chapters 8-19, with different images. In chapters 6 to 18, Christ opens the seven seals of the book. In various symbolic scenes we see the fate of the Church in the course of the centuries. The history of the Church is a spiritual struggle for the cause of Christ, the fulfillment of the kingdom of God, the victory of good over evil on earth, of Christ over the Antichrist, the devil. The army of Christ is made up of the saints of the Church, the believers. Their power is the faith in the blood of Christ; their armor is the word of God. The army of Antichrist is made up of the worldly powers, mainly the Roman Empire, symbolized by the two beasts and the harlot woman (Rev. 11:7; 13:1-17; cf. Dan. 7:11-12). In spite of the harshness of the images, the entire Book of Revelation is written to provide consolation and encouragement to the faithful who are struggling to keep the faith in Christ alive, notwithstanding the great sorrow they are experiencing. After each persecution, the book presents an image of consolation for the faithful (cf. Rev. 7:9-17; 10:1-11; 18:20). These images are a confirmation of the victory of the Church. They comfort the struggling Christians and help them to be "faithful unto death" and to receive the crown of life (Rev. 2:10-11). All of the events prepare and direct us toward the end, the Parousia of Christ. The Parousia is coming as judgment for the enemies of the divine plan and as a consolation and a reward for the struggling believers. The coming judgment is presented in the form of wars and punishment for the enemies, executed by God or Christ that leads to the final victory over Satan himself. There, we will have the end of the present plan of salvation, the end of the cosmic drama of history, and the beginning of eternal blessedness in the kingdom of God and of His Christ. The final confrontation with evil is presented in chapters 19 and 20. In the pericope 19:11-21, we have a summary of chapters 6-18. The image is very powerful. Christ appears in His magnificence as King of kings, Lord of lords, and Judge of all. The war is waged by the beast and the false prophet. Both of these are organs of Satan, representing the political and religious authority of Rome (Rev. 13:1-18). The outcome of the battle is prejudged. "And the beast was captured and with it the false prophet..." (Rev. 19:17-20). Thus the enemies of Christ and the Church were completely destroyed. At this point the cosmic drama has come to its end; the hostile powers have been thrown into the lake of fire, and one would have expected the end, the Parousia. St. John, however, presents three additional scenes which end with still another direct confrontation with Satan and his final condemnation (Rev. 20:1-10). In the first scene we see an angel binding Satan. In 9:1-2, we saw Satan falling like a star upon earth. The abysmal well opened up and various kinds of evil appeared. The abyss is considered to be the dwelling place of Satan (cf. Lk. 8:31). The angel binds Satan without resistance. This silent act itself speaks about the mysterious power of Christ over Satan (cf. Mt. 19:28-29; Jn. 12:31). In ch. 12:4-9, we see the first downfall of Satan. Satan lost, we might say, his battle on the heavenly plain by not succeeding in destroying the male-child that had ascended to heaven. (In the image perhaps we can see the birth of Christ and the persecution of mother and child by Herod in Mt. 2:7-18). This child is Christ who conquered Satan through the Cross and who was resurrected and ascended to heaven, to God and to His throne. This power of the Cross binds and restricts Satan. And with faith in Christ and in the power of His blood, the Saints are victorious in their struggle against evil (Rev. 12:11). For the faithful, the devil is indeed bound up. The grace of the sacrifice of Christ on the Cross forgives and sanctifies the Saints, unites them with Christ and makes them invincible warriors of Christ against Satan (Rev. 12:11; Rom. 8:31-39). The power of Satan is limited for one thousand years, that is, for a considerable period of time. Numbers in the Book of Revelation are always symbolic. Only God knows the actual length of this period. In another vision related to the previous one, St. John sees the faithful in their blessedness (Rev. 20:4). The vision contains thrones, and people are sitting upon them with the authority to judge. Who exactly are the people sitting, St. John does not tell us. In Rev. 4:4 the twenty-four presbyters, representing the Church, sat on thrones. Something like this had been promised by Christ to the Apostles and to the bishops (Mt. 19:28; Rev. 3:21; 1 Cor. 6:2). More probably it refers to all the faithful who have been liberated from the power of Satan and who rejoice in blessedness. "Also I saw the souls of those who had been beheaded for their testimony to Jesus and for the word of God, and who had not worshipped the beast or its image and had not received its mark on their foreheads or their hands" (Rev. 20:4). With a simple conjunction "also," St. John notes that in this vision he also saw the souls of the martyrs. (He does not say that those who sat on the thrones to judge were the martyrs, but that they were included there with the others). This indicates to us that the Church is really one of the living and of the dead, heavenly and earthly, triumphant and militant, one Church, all the believers united in a fulfilled and complete body, with a definite number ­of 144,000 sealed (Rev. 7:3-9; 14:3-5). "And judgment was given to them." The vision does not say whom they judge and how they judge. It only presents Christ as an image of the Church. Judgment belongs only to God. The Christian does not judge anyone (Mt. 7:1; Rom. 14:4-5). Judgment rather will be according to our deeds. Christians can judge the world only by their good deeds (Mt. 5:14-16). The blessedness of the saints is judging and teaching the world, especially the enemies of the Church. "They came to life (they lived ­ KJV) and reigned with Christ a thousand years," as long as Satan remained bound. Where they lived and where they reigned we are not told. What we can understand is that St. John saw the saints, the heroes of the faith, to be living and enjoying the blessedness of the kingdom of God; and for St. John all the faithful were martyrs-witnesses, as he himself was. We will see the blessedness in its perfection in Chapters 21-22. "The rest of the dead did not come to life until the thousand years were ended" (Rev. 20:5). In this third scene, the other dead, that is, the souls of the unbelievers, in contrast to the souls of the saints, did not live during this period of time. They were not worthy to partake of the blessedness, a life in the presence of Christ. The unbelievers, even when they are alive are really spiritually dead (Rev. 3:1; 19:21; Lk. 16:23-26). St. John calls this phenomenon "the first resurrection," a kind of resurrection before the general resurrection of all (Rev. 20:5-12). The text, however, does not indicate a resurrection; it only says that the souls of the saints were present and were taking part in the blessedness of the kingdom of God. "Blessed and holy" are they who have a part in the first resurrection. They are not afraid of the second death ­ the punishment in the lake of fire ­ which is the final separation from God and which will take place at the end of the millennium (Rev. 20:14-15). They have already passed the judgment (cf. Jn. 3:18; 5:24-29; 11:26). Those who live with Christ in the present life are not afraid of being separated from Christ in the Parousia (cf. Rom. 8:38-39; Phil. 1:23). "They shall be priests of God and of Christ, and they will rule with him for a thousand years" (Rev. 20:6; cf. 1:6; 22:5). This is the certainty of faith, that the now suffering Christians will for certain share with Christ the blessings of the kingdom of God for "a thousand years," that is, forever and ever. Source: From At the End of Time: The Eschatological Expectations of the Church.